In 1775 Nathaniel Bayly, MP for Abingdon, as a trustee of a local charity, was involved in a land swap with Charles and Henry Berners, the owners of Hanwell Park, the only sizeable estate in the very small parish of Hanwell in West London. Bayly himself was the tenant of an insignificant property in Hanwell for a while – one of his children was born there – before moving to a house in London. The Berners wanted to make ‘improvements’ to their property at Hanwell Park, and so acquired additional land to the south of the park, demolishing the houses there to create better views from the house. Was this the Hanwell property for which research shows Lancelot ‘Capability’ Brown undertook a survey and produced plans? Listings in Brown’s account book of £3. 3s. 0d for ‘a survey made, a fair drawing of & taken by Mr Lapidge’ and ‘£5. 5s. 0d for my own trouble & a journey there’ carried out for N. Bayly, Esq. at Hanwell, Middlesex, indicate that it might well have been as there were no other sizeable properties in Hanwell at that time. Samuel Lapidge was a surveyor who frequently worked with and for Brown. However, no definitive further evidence has yet been identified to support this: the survey may well have been for Hanwell Park or could have been for a completely different property in which Nathaniel Bayly had an interest. Hanwell Park appears on early Ordnance Survey maps of Ealing, but there is nothing obviously Brownian about its layout. 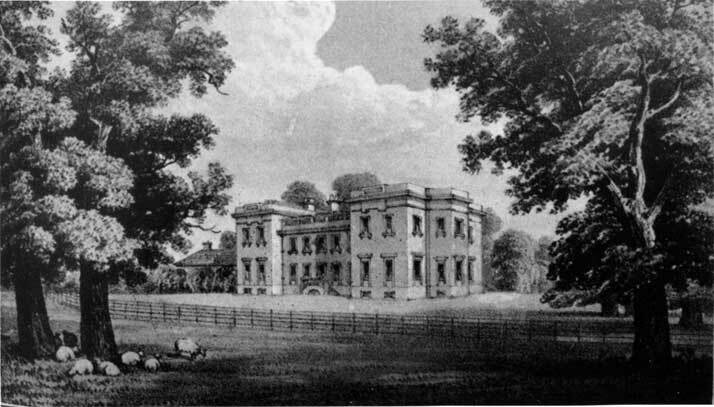 Nevertheless there is an additional link to Brown in that Henry Berners’ son William owned a substantial property in Suffolk – Woolverstone Hall , where Nathaniel Richmond, another of Brown’s surveyors, may well have been involved in remodelling that estate, although this again remains unproven. Unfortunately little remains of Hanwell Park whose house was pulled down at the beginning of the twentieth century and the site has been largely built over. Also in West London was Ealing Place, also known as Ealing Park or Place House, in South Ealing. Like Hanwell Park, this is now built over, although a scrap of the garden remains as part of a school. The clearest evidence for Brown’s involvement here is found in Humphry Repton’s Fragments on the Theory and Practice of Landscape Gardening (1816), in which he refers to Ealing Park as Brown’s work: Repton laments the fact that the trees had been allowed to grow too tall, thereby obscuring Brown’s designed views. The Ealing Park estate is clearly identified on John Rocque’s 1746 map of the environs of London, and on subsequent eighteenth- and nineteenth-century maps. It is perhaps relevant to the search for Brown in West London that between 1745, when the property was acquired by Francis Dashwood (founder of the HellFire Club), and 1783 when Brown died, the estate had a number of different owners and tenants. Several of these had clear connections to Brown’s work elsewhere. Sir Richard Lyttleton, a lieutenant–general in the British army and later MP for Brackley and Poole, was married to the Dowager Duchess of Bridgewater, whose family home was Ashridge, where Brown redesigned the landscape during the 1760s. It is also reported that in 1760 Lyttleton exchanged the property, including ‘fine gardens’, with the Earl of Warwick, Francis Greville, for whom Brown had redesigned the grounds around Greville’s country seat at Warwick Castle in 1750. Are these links mere coincidences or was Lyttleton influenced by his knowledge of Brown’s work at Ashridge and Warwick to employ his expertise in some way at Ealing Park? For both the Hanwell and Ealing estates, the links to Brown’s work elsewhere offer scope for further investigation using the archives in Suffolk, Hertfordshire and Warwickshire. Knowing when to stop does not come naturally to the researcher who believes that the next box of papers might contain that vital piece of evidence that makes months of tantalising effort worthwhile!